Japan is very dichotic when it comes to recycling. They are very proactive when it suits their needs, but in other ways they are terrible. One thing that I find very amusing is the fact that many companies will thank you for recycling. There is a little hidden secret for anyone who drinks from a milk or juice carton. When you recycle them, they actually thank you for it. If you go into any regular supermarket and buy a carton of milk or juice, you are very likely to get this thank you message. If you recycle your carton, you have to rinse it out, open it up and then return it to the supermarket for recycling. If you open up the back side, “リサイクルありがとう” or “Thank you for recycling.” is usually written on it. This is a very polite and typically Japanese. Since this is a very trivial fact, it is often unknown to even Japanese people. I never even knew it existed until I saw it on a program with foreigners talking about the little things they like about Japan. It isn’t even important in everyday life, but it is an interesting view into Japanese culture and how formalities are important. 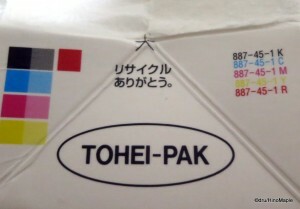 This entry was posted in Culture, Food and tagged japan, Juice Box, Milk Carton, Recycling, Recycling in Japan, Thank You by Dru. Bookmark the permalink.